75 Years Later, Anne Frank's Diary Still Has Much To Teach : NPR Ed The first entry of what became The Diary Of A Young Girl was written 75 years ago this month. We asked fifth-graders at Anne Frank Elementary School in Philadelphia what they learned from it. 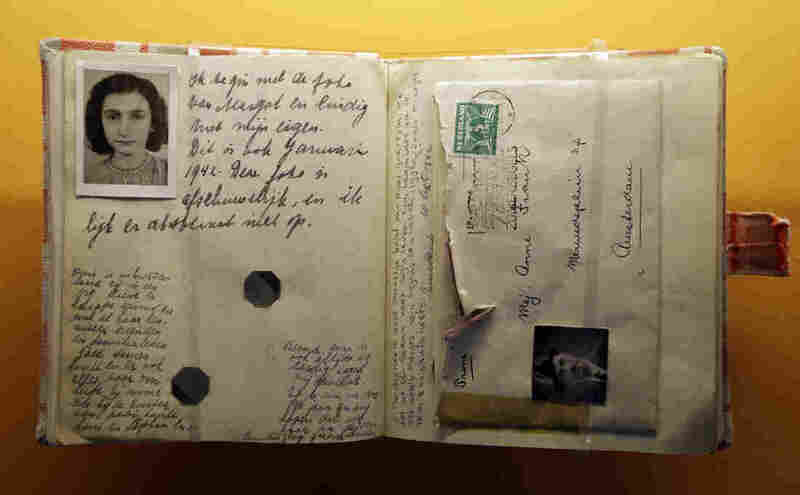 A replica of Anne Frank's diary is displayed at the Indianapolis Children's Museum in Indianapolis. Seventy-five years ago this month, a 13 year old girl in Amsterdam sat down and wrote the first entry in a red-checkered diary. Over the next two years, hundreds more pages followed as Anne Frank told about life in the "secret annex" where her family was hiding from the Nazis. She wrote about the struggle for food, the daily tensions, and the terror of being found. She also wrote about celebrity gossip, quarrels with her mother, and of her first kiss. The last entry was Aug. 1, 1944, just three days before the family was discovered and sent to concentration camps, where Anne, her mother and sister, died. Amazingly, the diary survived. 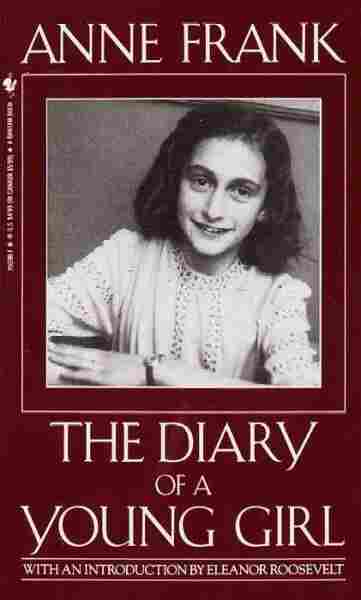 After the war, Otto Frank, Anne's father and the only surviving member of the family, edited and published his daughter's diary. Today, Anne Frank has become the most famous young author of all time, and The Diary of a Young Girl is one of the most widely read books in the world, translated into more than 65 languages. For educators, the diary provides a rare chance for students to learn about the Holocaust from someone their own age. At Anne Frank Elementary School in Philadelphia, fifth graders in Elizabeth Angelo's class have just finished reading it. "I felt like it was necessary, they needed to know who this school was named after," said Angelo. "This was a real girl that is close to their age and kids can relate to that." The class spent months reading the book and learning about the Holocaust. Angelo says her students asked a lot of the questions people around the world have been asking for generations: How could this have happened? How was it allowed to happen? And the book's message was especially resonant in a school as diverse as Anne Frank Elementary, where students come from more than 40 different countries. "I have kids from Russia, Ukraine, Palestine, Colombia, I mean all over," Angelo says. And the book, she says, led to class discussions "about what our differences are and how we can't necessarily judge someone based on that." For example, "my Muslim kids were like 'Oh, well you know, this is going on in the world with Muslims!' It kind of brought them together." I asked some of these fifth graders what the book meant to them, and clearly its message came through. Alexander Dolgikh: "I guess my favorite part was when like, they had hope. Anne Frank, she found hope in every single thing, even the horrible things that that Nazi[s] did, she sees the good in everything." Taslim Sabil: "Anne had a dream in the book, she said she wanted to keep her memory going alive and I feel like, um, that our school, after it was named after Anne Frank, I feel like, it could spread the message too." Sebastian Gonzalez: "Anne Frank, she still lives in all the staff and students in their hearts. We still remember her as if she was still alive and that we should never forget her because we don't want this to happen again."